I used to regularly blog about what a domestic disaster I am. But there are only so many times you can talk about your dislike of cleaning before you find out that your neighbor reads your blog and doesn't want her kids to come over to your house anymore. Ahem. But now I have something positive to share. I have solved my sock problem. I gather from pop culture that we are not the only family that has a problem with missing socks. But I am sure we're the only family where there have been HUGE piles of socks scattered around the master bedroom for weeks at a time. You see, it wasn't that we'd have 3 or 4 missing socks each week. We would always have 30. But there weren't actually missing, they'd just gone through another load and were in another basket. Or something. The only way I can get myself to fold laundry - or to pair socks - is to do it while I'm watching TV. So I would pile all the partnerless socks on the floor to await the next basket of clean laundry. Sometimes they were. Sometimes they weren't. Sometimes I couldn't even tell. I tried having each member of the family have a certain type of sock, but that didn't work because different sports require different socks and so do different types of shoes. Next I tried having everyone match their own socks. That worked well, except when there were arguments about whose socks were whose. And except when it took them an hour to make 3 pairs. 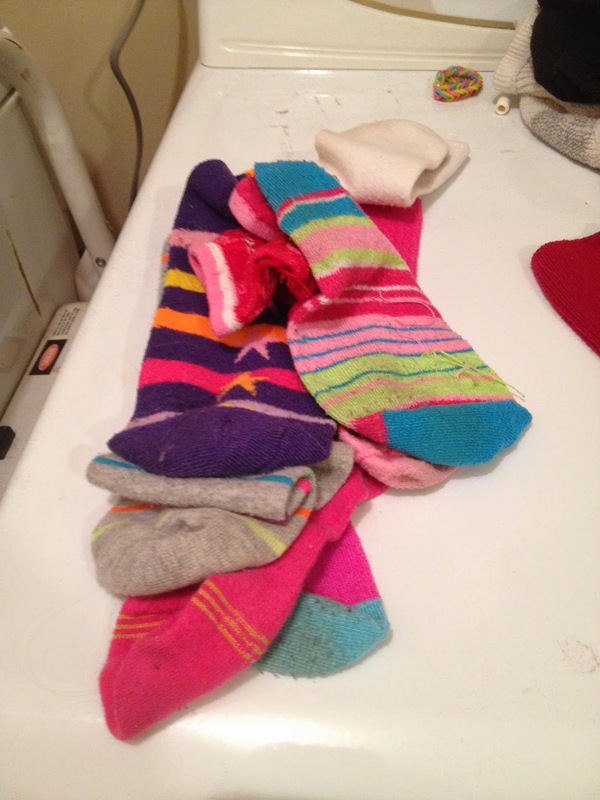 In desperation, I encouraged everyone to pair their socks BEFORE putting them in the wash.
That one might have worked, except that the socks didn't really get clean that way. And I was spending a lot of time yelling about sock pairing. I really don't need any more reasons to yell. And I really like clean socks. So then I had an epiphany. It probably won't seem like much of an epiphany to those of you who excel at domestic things, but please remember I have a low bar. I've screwed up pasta before. Anyway, I now sort socks as soon as they come out of the dryer. I pull them out and pile them by owner. It makes it much easier to find pairs. It takes all of 5 minutes to go through each pile after a load. Then I just throw pairs into the clean laundry basket and bring them upstairs to be put away. No more giant piles in the bedroom! I mean, we still have a lot of partnerless socks. And it's not like I've come up with a creative use for them. (Puppets? Cleaning rags? I'm not sure which way to go here.) But there's much less angst involved in the whole process. Now if I could just figure out why most of the partnerless socks are Hugmonkey's. I do the exact same thing-sort b owner! Makes it so much easier! LOL - I think that my funniest lost sock story is that I just recently found some of my son's socks from when he was an infant in my own sock drawer. I am sure that it was my fault that I was sleep deprived and put them in there then complained that I couldn't find them. Thanks for sharing!! We always have lots of extras! I don't have kids yet, its just me and my bf but for now my "sock method" is just buying like two BIG packs of identical socks per person so ALL of my socks match and all of his socks match and then I don't bother pairing them. It's not perfect because inevitably one pair of socks gets dirty/dingy/stained and then one from that set and one brand new clean one get paired together and it looks dumb, haha. My mom used to fold over the ankle part of socks to pair them when I was a kid so they'd lose their elastic and wouldn't 'hug' our ankle anymore and to this day I can't stand socks with loose elastic, so my method is the only way I know of to avoid that. haha. I Do This Faithfully Great Minds Think Alike LOL! This is hilarious because I have a "lost sock" basket..and it is full! Where do they go darnit! I don't know, the sock gremlins are very active in my house. For my boys I buy all the same socks. One wears white and one wears black. Totally different sizes. I don't pair them, I put them away loose. Truthfully though, I don't know why but we don't lose many socks. We do the same thing. I pile them by owner. But I have also tried to switch over too all the same kinds and style for each kid.